What does “Fearless” means to you? Not afraid of height? Not afraid of snakes? Not afraid of the dark? For Aaron Crow, “Fearless” to him means to swallow needles right in front of the audiences, the possibility of getting shot by a real bullet from a paintball machine gun and many more. Being fearless; is also a positive theme for the audience, to face and overcome our fears, to be stronger. It was an honour to be seated at the VIP sections with all the bloggers. With the fusion of magic, suspense, risky stunts and mystery, Aaron is able to capture the attention of a crowd without uttering a single word. His unmatched power and eloquent silence has long since become his onstage trademark, always leaving his audience at the edge of their seats and longing for more. I was constantly wow-ed by him and I couldn’t take my eyes off the stage for a moment, fearing that I might just miss the very moment where the action takes place. Aaron and his crew were so interactive with the audience during the show. Many were called up to be part of the stunts, including Eileen, Leong, William and also Eric. The most unforgettable scene would be the one where Aaron swallowed 3 needles right in front of my eyes. He was standing at the VIP section where he starting to swallow two needles, passed to him by two audience, and another needle feed by one of the bloggers, Eileen. I can see that Eileen was in shocked when Aaron asked her to put the needle into his mouth. “Oh my, the needle would have killed him in his throat” thoughts running through my mind. How did he do it? Swallowed 3 needles, a long thread, and pulling them out from his mouth, tangled. Leong, the saviour of the night. He saved my beloved Lenice. Aaron throw a paper ball towards the audience, and it hits Lenice’s knee. But… Leong stood up for her and went up to the stage. *Blink blink* eyes with heart. None of them, including the audience, knows what is the knife. Either Leong or Aaron would have lost their hands during this stunt. OMGGGGG! This 1 hour feels like a lifetime of suspense and thrill. You can see that Aaron practiced a lot just to ensure the perfection of his show. He is always ready to perform his best for all the audience. It is definitely worth your time and money to catch “Aaron Crow Fearless! Cheating Death Nightly”. So…. It’s Now or Never. World Famous Silent Mentalist, Aaron Crow is now at Resorts World Genting. Tickets for “Fearless! 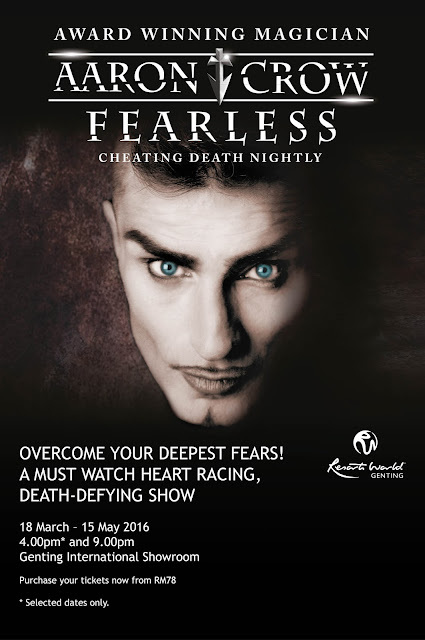 Cheating Death Nightly” at the Genting International Showroom from 18 March to 15 May, 8pm and 4pm) are priced at RM78 (PS2), RM98 (PS1) and RM119 (VIP).